Almighty and everlasting God, who kindled the flame of thy love in the heart of thy holy martyr Bernard Mizeki: Grant unto us thy servants a like faith and power of love, that we, who rejoice in his triumph, may profit by his example; through Jesus Christ our Lord, who liveth and reigneth with thee and the Holy Ghost, one God, for ever and ever. Amen. 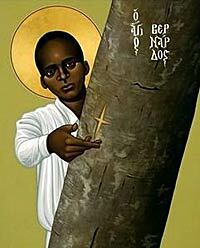 Almighty and everlasting God, who kindled the flame of your love in the heart of your holy martyr Bernard Mizeki: Grant unto us your servants a like faith and power of love, that we, who rejoice in his triumph, may profit by his example; through Jesus Christ our Lord, who lives and reigns with you and the Holy Spirit, one God, for ever and ever. Amen. Bernard Mizeki was born in Portuguese East Africa (Mozambique) in about 1861. When he was twelve or a little older, he left his home and went to Capetown, South Africa, where for the next ten years he worked as a laborer, living in the slums of Capetown, but (perceiving the disastrous effects of drunkenness on many workers in the slums) firmly refusing to drink alcohol, and remaining largely uncorrupted by his surroundings. After his day's work, he attended night classes at an Anglican school. Under the influence of his teachers, from the Society of Saint John the Evangelist (SSJE, an Anglican religious order for men, popularly called the Cowley Fathers), he became a Christian and was baptized on 9 March 1886. Besides the fundamentals of European schooling, he mastered English, French, high Dutch, and at least eight local African languages. In time he would be an invaluable assistant when the Anglican church began translating its sacred texts into African languages. He moved his mission complex up onto a nearby plateau, next to a grove of trees sacred to the ancestral spirits of the Mashona. Although he had the chief's permission, he angered the local religious leaders when he cut some of the trees down and carved crosses into others. Although he opposed some local traditional religious customs, Bernard was very attentive to the nuances of the Shona Spirit religion. He developed an approach that built on people's already monotheistic faith in one God, Mwari, and on their sensitivity to spirit life, while at the same time he forthrightly proclaimed the Christ. Over the next five years (1891-1896), the mission at Nhowe produced an abundance of converts. Many black African nationalists regarded all missionaries as working for the European colonial governments. During an uprising in 1896, Bernard was warned to flee. He refused, since he did not regard himself as working for anyone but Christ, and he would not desert his converts or his post. On 18 June 1896, he was fatally speared outside his hut. His wife and a helper went to get food and blankets for him. They later reported that, from a distance, they saw a blinding light on the hillside where he had been lying, and heard a rushing sound, as though of many wings. When they returned to the spot his body had disappeared. The place of his death has become a focus of great devotion for Anglicans and other Christians, and one of the greatest of all Christian festivals in Africa takes place there every year around the feast day that marks the anniversary of his martyrdom, June 18.